Opening Act: Margaret Thatcher is dead. 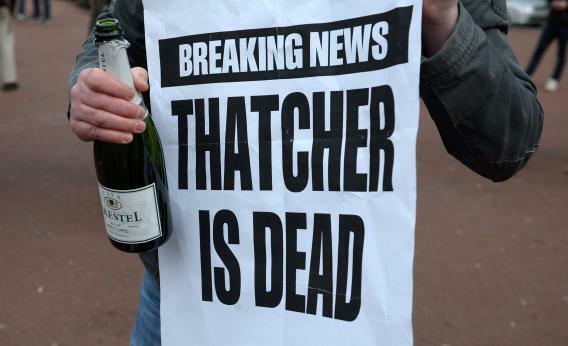 A man poses with a bottle of cava and a sign displaying the message ‘Thatcher is Dead’ as other members of the public gather in George Square to mark the death of Baroness Margaret Thatcher on April 8, 2013 in Glasgow, Scotland. Margaret Thatcher has died of a stroke at age 87, after nearly a decade of quiet withdrawal from public life and speaking. I’d expect a gulf of difference between American coverage, in which Thatcher will be remembered as a glass ceiling-shattering pal of Ronald Reagan; and British coverage, which will reflect how hated Thatcher was by her political foes. This is a real tweet from George Galloway, the former Labour MP who keeps winning by-elections as an anti-war third party candidate. It’s a reference to a song by Elvis Costello about how wonderful Thatcher’s death would be. When Ronald Reagan died, American politics and memory had already sanctified him; many people flying into Washington for the funeral arrived at Ronald Reagan National Airport. The debate over Thatcher’s legacy of privatization looks, from the American perspective, to be pretty well over and won. But we’ve never had a national health service and we broke the power of our unions 60-odd years ago, and only briefly did we have as high a top tax rate as the U.K. in 1979, so the comparison’s never going to make sense here. At some point today I expect there’ll be a statement from a former Alaska governor about how much Thatcher meant, but we can probably ignore that. Jon Favreau, newly ensconced as a Daily Beast columnist, bemoans sequestration. Rucker and O’Keefe report that a modest gun control compromise is alive after all. Manchin and Toomey are developing a measure to require background checks for all gun purchases except sales between close family members and some hunters, which addresses concerns of some conservatives, according to the aides, who spoke on the condition of anonymity because they were not authorized to talk publicly about the talks. And in the same paper Tom Hamburger has the definitive profile of the NRA’s lobbying, which elevates the hoi polloi paranoia about how the government is coming to grab the guns of fathers before they can will them to their sons. Tim Murphy explains the “Common Core” conspiracy theory, whose sudden buzziness on the right suggests—surprisingly—that an un-Fox’d Glenn Beck still has some clout. David Carr salutes Roger Ebert, branding/media empire trendsetter. Correction, April 8, 2013: This post originally misspelled Roger Ebert’s first name.